2. Remove the fuse panel cover by pressing the tab and pulling the cover up. When the blade type fuse is disconnected, remove it by using the clip designed for changing fuses located in the engine room fuse box. Upon removal, securely insert reserve fuse of equal quantity. 4. Push in a new fuse of the same rating, and make sure it fits tightly in the clips. If it fits loosely, we recommend that you consult an authorized Kia dealer. 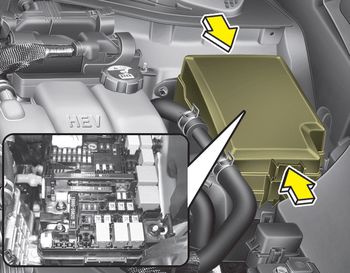 After checking the fuse panel in the engine compartment, securely install the fuse panel. If not, cover through the audible clicking sound. Electrical failures may occur from water contact.